Editor’s Note: Google is starting construction on our newest data center in Jackson County, Alabama. The new site marks a $600 million investment for our company and will bring as many as 100 high-skilled jobs to the community. This is part of Google’s expansion to 14 new data centers and offices across the country. Today, our head of global technology partnerships for Google Cloud, Dr. Nan Boden, spoke at the groundbreaking in Widows Creek, the site of a former coal-fired power plant where her father once worked. Data centers are the engine of the internet. They help make technological advances around the world not only possible but accessible to billions of people who use cloud services. Every day, more people are coming online, asking and answering big questions, and identifying new opportunities and solutions to bring about change. I help build global partnerships for Google Cloud, and we depend on our data centers to ensure that large companies, small businesses, students, educators, nonprofit organizations, and individuals can access key services and tools in a fast and reliable way. Today, I participated in the groundbreaking of our newest data center in my home state of Alabama. I was born in Sheffield, raised in Athens and am a proud University of Alabama alum. My family roots run deep with the Tennessee Valley Authority (TVA)—both my late father and grandfather were career TVA electricians. My father’s job at TVA gave me and my family a better life, and his personal focus on education created an even greater path to opportunity for me. That’s why I’m so proud that Google can help bring that same opportunity—for education and employment opportunities—to families here in Jackson County. As part of our commitment to this community, Google will donate $100,000 to the Jackson County School District for the growth and development of the region’s student STEM programs. With the new data center, Jackson County will help deliver information to people all over the world. From an infrastructure perspective, this means focusing on how to best route data securely, reliably, and quickly. And that takes energy. Since the 1960s, Widows Creek has generated energy for this region, and now we will use the plant’s many electric transmission lines to power our new data center. Thanks to our partnership with the TVA, we’ll be able to scout new wind and solar projects locally and work with TVA to bring new renewable energy onto their electrical grid. Ultimately, this helps Google to continue to purchase 100% renewable energy for our growing operations around the world. Being a part of this groundbreaking, not far from where my father worked at a coal plant years ago, humbles and inspires me. 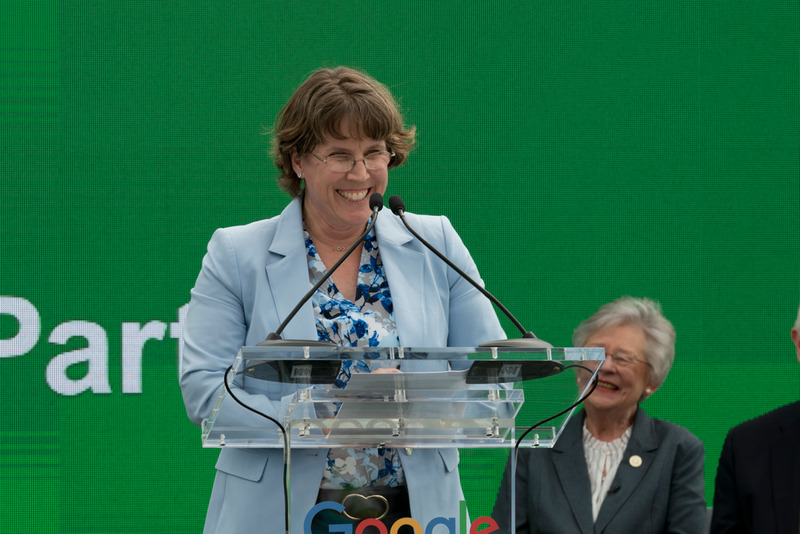 My work at Google brought me home to Alabama, and now Google can call Alabama home, too.